How to Prevent the Growth of Algae in Garden Pond and Fountain? July 21, 2018in GardeningNo CommentsHow to Prevent the Growth of Algae in Garden Pond and Fountain? Water is a critical ingredient of life and it means that when there’s a pool of water, life will thrive in and around it. Unwanted plants, such as algae, may spread quickly in our garden pond, degrading its original beauty with greenish deposits on the surface and at the bottom. We should expect rapid growth of algae during the summer as the water temperature is consistently warm. Early signs of algae growth are detectable usually during late spring at May and we should constantly watch the garden pond and fountain for changes of color to shades of green or brown. Very small animals, such as daphnia and rotifers devour on large bloom and should slow down the growth, but their population will decline during early summer as the water temperature goes above 72 degrees Fahrenheit. At this stage, we should be able to use bog plants or hyacinth to limit the amount of nutrients that the algae tend to thrive on. We may also use UV light treatment to kill algae spores inside the pond. Planktonic algae is especially dangerous to the fishes in our garden pond, because they reduce the oxygen level in the pond. At small amount string algae is a good nourishment for food, but if it multiplies quickly, the oxygen level will go down as well. As we use fertilizer for nearby plants and trees, we should make sure that none enters the garden pond. Granular or liquid fertilizer will quickly cause algae to grow at great number and algae bloom can be triggered. If we have sudden abundance of algae in our garden pond, we should consider whether there’s something that causes the presence of excess nutrient. When there are too many fish inside the pond, the fish feed and waste could cause accumulation of nutrients, causing algae to grow quickly. The best way is to limit the amount of fish inside the pond and regularly replace the water. 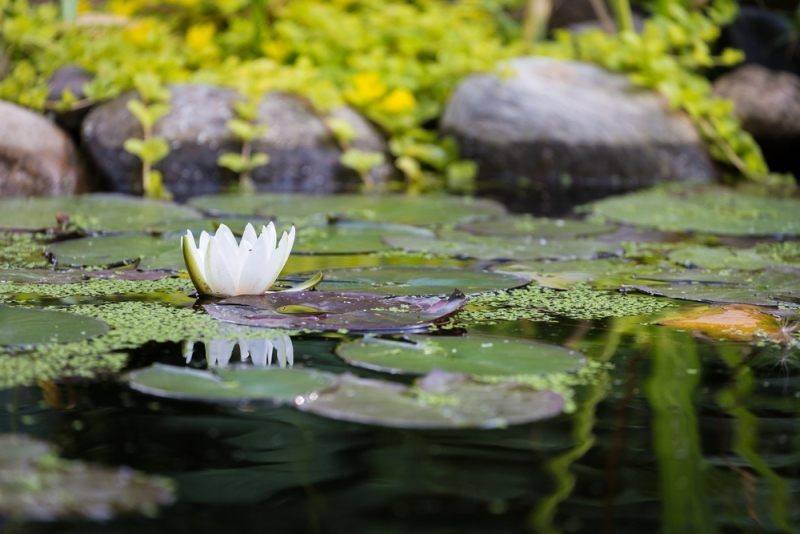 An effective biological filter will also prevent the pond to get contaminated by foreign algae spores, suspended particles and excess nutrients. String algae are also known as moss and it appears as hair-like fiber on our pond. The part of the filament that’s exposed to the sunlight will die first, causing the appearance of brownish-green scum in our pond. If we wring out the slimy mess, we may find out that it’s not slimy at all. It gas fibrous and soft cotton-like texture and the smell of freshly mowed grass, which is not too bad. The best thing to do right now is to remove the algae and its dead remains by hand. The remains of dead algae will also reduce the water quality and make the fish suffer. Once the water is cleaned, we may use the UV treatment equipment to kill remaining spores and prevent the resurgence of algae bloom in the near future. The garden pond and fountain should be an appealing part of our landscape, so we need to keep it that way.